Six days in Hell define every SEAL that moves past the point of no return in their minds. Robert Adams, MD, brings the experiences of his classmates into view with real, difficult to believe experiences, described in frightening detail by the men that lived through the frigid cold, filthy muddy days, and body destroying events of a winter Hell Week. Hell Week has never been described so effectively. Six days in Hell define every SEAL that moves past the point of no return in their minds. 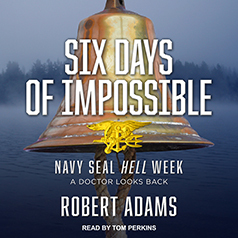 Robert Adams, MD, brings the experiences of his classmates into view with real, difficult to believe experiences, described in frightening detail by the men that lived through the frigid cold, filthy muddy days, and body destroying events of a winter Hell Week. Eleven of seventy men went on to graduate and serve over forty years in almost every SEAL or UDT team with honor. Listen to their real time story and learn why these eleven men succeeded when so many others failed. Colonel Robert Adams, MD, MBA, served fourteen years in the Navy (twelve as a SEAL) and eighteen years in the Army. He changed services to attend medical school, and applies his analytical skill to look back at the men that shivered and struggled through Hell Week together. He brings decades of insight learned caring for others to an insightful analysis of why the men of his BUD/S class 81 achieved the improbable.